COMPANY PROFILE CG Power & Industrial Solutions Ltd provides electrical and allied equipment. It offers transformers, switchgear, circuit breakers, network protection and control gear, project engineering, HT and LT motors, drives, and Power Automation Products. CG Power & Industrial Solutions Ltd is an India based company engaged in providing products, services, and solutions to utilities, industries and consumers for the management and application of sustainable electrical energy. Its business segments are Power Systems, Industrial Systems, and Automation Systems. Power Systems include products and services from ultra-high-voltage, high voltage, medium voltage and low voltage like transformer, switchgear and turnkey projects whereas the Industrial Systems business segment includes rotating machines of power and ratings, automated AC, DC and variable frequency drives and control systems like electric motors, alternators, drives, traction electronics and SCADA. It operates in India and internationally and generates its revenues majorly from India. 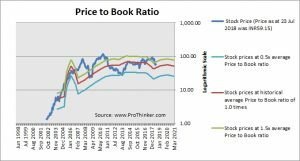 At the price of INR59.15 as at 23 Jul 2018, Cg Power & Industrial Solutions Ltd is trading at a Price to Book Ratio of 1.3 times current book value. 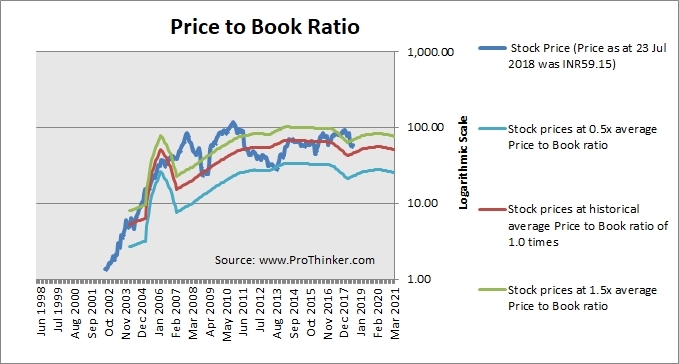 This is a 30% premium to its historical average Price to Book Ratio of 1.0 times.